"Once in a blue moon..." means seldom or absurd. 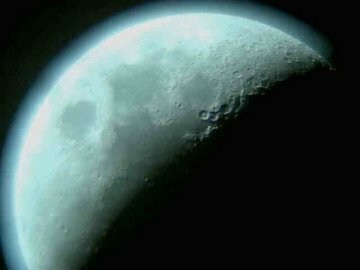 But, believe it or not, sometimes the moon really does turn blue, usually after volcanic eruptions or major forest fires. Volcanoes and wildfires fill the air with ash and dust. If the airborne particles are just the right size--about 1 micron (one millionth of a meter) wide--they act like a color-filter, tinging the moon blue. Clouds of water droplets, ice crystals or fine-grained sand can do the same thing. There are other reasons for odd-looking moons, notes atmospheric optics expert Les Cowley. "Our eyes have automatic 'white balances' just like digital cameras. Go outdoors from a cosy cabin lit by an oil lamp (yellow light) and the moon will appear blue until your eyes adjust." Have you ever seen a blue-colored moon? Share your story. from Tom King of Watauga, Texas: "I had never paid any real attention to the term 'Blue Moon' until a recent October evening. 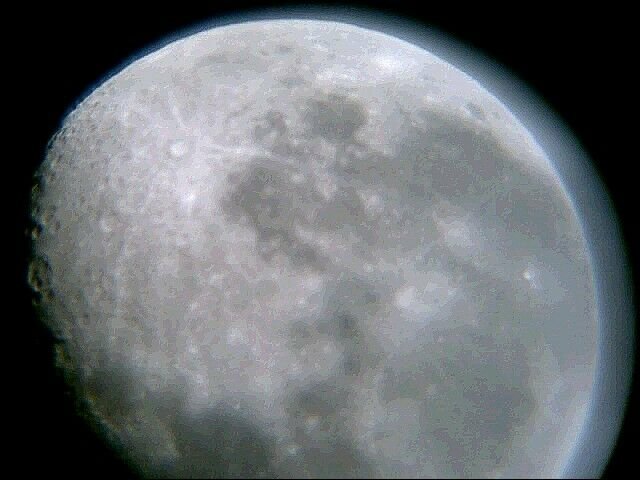 I had my telescope set up in the backyard in Watauga, Texas, and I was about to take it inside due to deteriorating viewing conditions. Before I did, the moon began rising in the east with a strange blue tint I had not seen before. I used my SACIVb CCD camera attached to a 5" Newtonian telescope to capture this image (October 13, 2003, 12:32 AM local time). The temperature was falling and the air was damp and heavy with moisture." 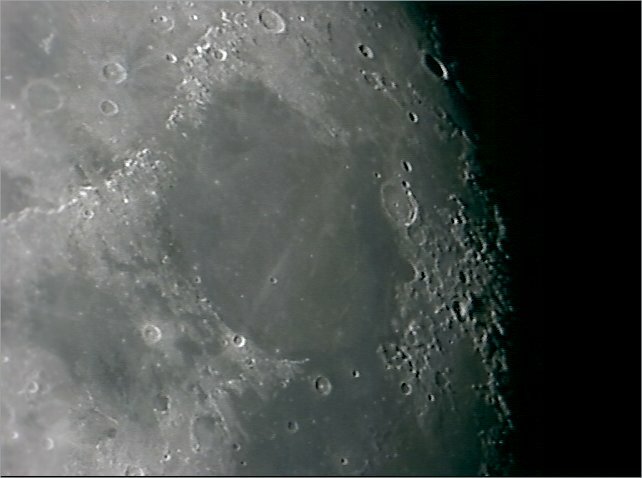 "The moon was quite striking on these two October evenings. The lack of dynamic range in the camera failed to capture the strength and true blue tint that I witnessed with my eyes. Our eyes are indeed some of the best cameras ever made! Here is one last picture from January 10, 2004, provided as a sanity check to assure you that my moon shots do not always have this blue hue." from Tom Buchanan near Raleigh, North Carolina: "On Thursday night, March 13, 1952, I was attending a regular boy scout meeting in a log club house north of Raleigh, North Carolina. The night was fairly warm, so somebody opened the door which faced eastward. We scouts were seated while my father, the scoutmaster, was trying to teach us something. The other scouts started punching each other and looking out the door. Finally, one punched me and said, "Look out the door. The moon is blue!" I looked and, sure enough, the rising moon, which was two days past full, was distinctly bluish. When the scoutmaster learned why we scouts were inattentive, he recessed the meeting so we could go outside and see this strange phenomenon. One of the scouts claimed that he could smell sand in the air. A couple of hours later as the moon climbed much higher in the sky, it became a pale yellow." from Robin Scagell in Australia: "I have seen a real blue Moon. It was a brilliant, icy blue, and it was in Australia in 1983, at a time when El Chichon had recently erupted. I even took a photograph of it in the twilight. But I knew that the photo would not show anything different about the Moon, and I was right. The pictures show a normal, white Moon. Later that evening, the Moon in the sky was its normal colour. The explanation was that the strong violet colour of the sunset was affecting my personal white balance, so the white Moon actually appeared a complementary colour. The same effect would explain green Moons as well. Later on, when the twilight colours faded, my white balance had no reference points so the Moon appeared white again. 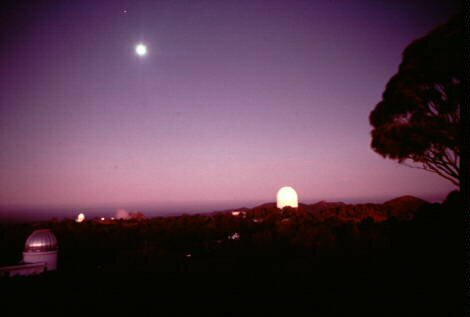 Here is a photograph of the Anglo-Australian Observatory taken on that occasion." from Larry Rova of Anaheim Hills, CA: "In 1959 or 1960 while a student at the University of North Dakota I saw a blue moon during a very heavy snow storm in Grand Forks, ND. Five of my fraternity brothers and I jumped in a single car to scout the streets around the campus and see if anyone need a push out of a snow bank. We did help several stuck cars proceed on their way but the highlight of being out in the storm that night was the sight of a very blue moon. At the time I thought that was what was meant by a 'blue moon' however later I did learn about the definition of two full moons in the same month. I'll never forget that night. We even had to push our car out of the snow to get back home. I moved to Southern California after graduating in 1962 and am still here." from Carroll Rudy of Wisconsin: "It happened on a Sunday in the September of 1950 --September 24 to be exact. I was a 13-year-old living in rural Northwestern Pennsylvania near Corry, PA, on my parents' small farm." "It was a cloudy day. Early in the afternoon, the sun disappeared and it became as dark as midnight. Lamps were lit and lanterns brought out. I went outside to walk around and check the livestock, and found that the chickens had all gone to roost, all the wild birds had gone to sleep, and the farm animals had gone into their normal nightime sleeping places in barns and coops. We could see that the streetlights had come on in the nearby town. We had no Television at the time, but heard over the radio that there was a forest fire in Canada producing so much smoke that it had blacked out the sun." "People were very frightened, and some thought the world was coming to an end. Others thought the Russians had done 'something' as the Cold War was in full flower then. Some thought the dreaded nuclear holocaust had come, but most people I knew thought it was a secret government smoke-screen experiment related to Cold War defense. The true believers in conspiracy never would accept the forest fire 'cover-up' story as they called it. Some of my classmates to this day still stick to the 'government cover-up' tale. Whatever one's thoughts at the time, it was a very frightening day. As the day waned, the smoke thinned a bit and the sun could be seen through the blackness as a faint blue orb, but it never did get light outside. After nightfall the moon which was full that night, was blue. I read later that blue moons were seen as far away as Europe on Sept. 26, 1950." "There was a pervasive smoky smell in the air that didn't smell like wood smoke, but like peat smoke, a smell similar to smoldering wet hay. I remember being ill for several days afterward with a cold-like respiratory disorder including runny nose, stuffy head and irritated eyes." "Most people who lived in Western Pennsylvania at the time remember that day vividly if they had any reason to be out-of-doors. We always called it 'Black Sunday' afterward. Sometimes you read references from people said they saw stars because it was so dark, but that is not true. Obviously no stars were visible because the smoke was so thick we could not even see the sun. I remember a sky that was totally black, smelled like smoke and was truly frightening." from Tom Whiting of Erie Pennsylvania: "I was just a young boy 5 or 6 years old, living in New Castle PA in the summer of 1946 or 1947 when smoke from forest fires (in Canada?) drifted down over the Western Pennsylvania area. It got really dark in the daytime;I remember the street lights came on in the early afternoon, like 1 or 2 pm, and you could smell the slight odor of smoke. Anyway, for a night or two, we had this bluish-tinged near-full moon. I don't remember the exact year or month. I just remember we kids were all scared, and thought maybe the world was coming to an end. (Not because of the moon, but rather the daytime darkness). My one and only Real Blue Moon!" from Samuel L. Sievers of Vincennes, Indiana: "I am 64 years old. I recall riding with my father in his large semi-trailor, returning to southern Indiana from Chicago's South Watermarket. This was a bouncy 6-hour trip. We were hauling watermelons, so it had to be in late July or more likely August, somewhere between 1954-1957. I wondered what sort of evil the bluish moon meant, and dad wisely said it was probably dust or smoke."